A nice tool which calculates bits. The number can be displayed in binary, octal, decimal and hexadecimal format, and you can use presets with names for the bit numbers or define your own ones. Presets for unix file rights and Adobe PDF form elements (no one will ever use this one) are included. Just a small tool for applying crypt functions (like md5, crypt, DummyCrypt) to a string. Easy copy & paste with own buttons. 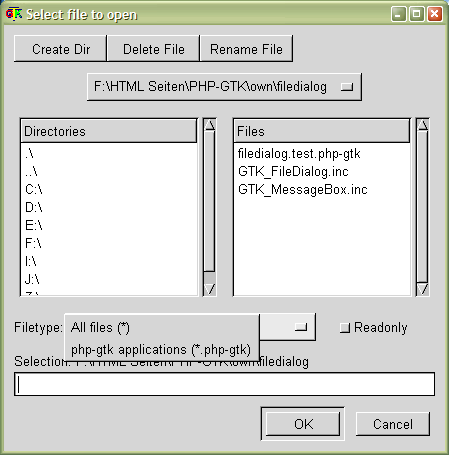 The GTK has an built in File Dialog, which is very difficult to handle. 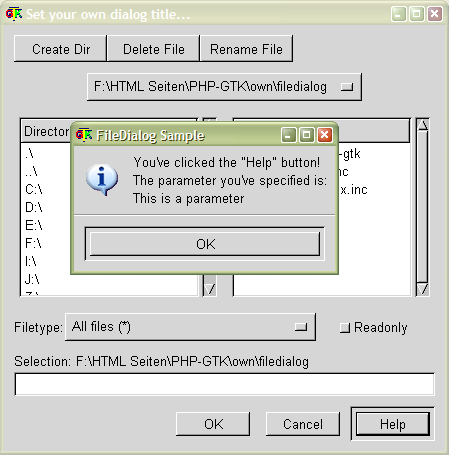 You've to create the GtkFileDialog, Connect the buttons, write the handlers.... check the filenames and and and. How would it be just to use $strFilename = FileDialog(...)? DirSelection - no files, only select dirs! 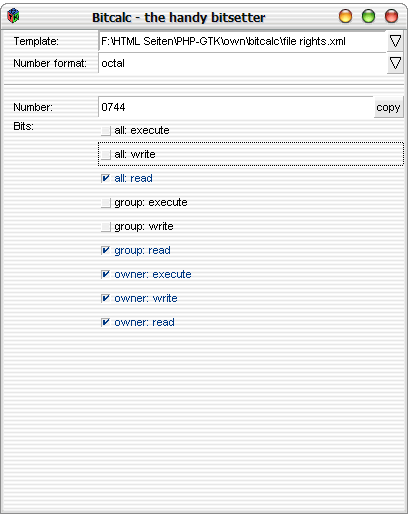 In version 1.1, gettext support is provided. Here is the solution if you want to have a multilingual application. Based on the GNU gettext functions, it enables you to translate your PHP-GTK application into the languages you want, even the glade files! It provides a gettext-loader which loads the gettext extension into php or, if this is not installed on the user's system, provides wrapper functions making sure the app will work in every case. 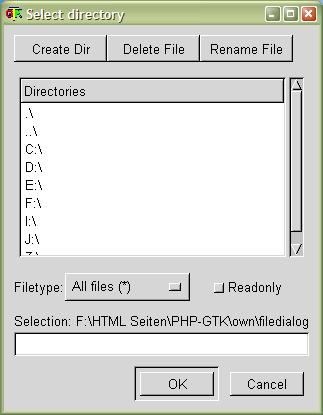 For windows, the "php_gettext.dll" library is packed in the zip. If you're using glade files, a glade2po converter is included. A translation test script is also shipped with the files. Tool for creating HTML forms (with text boxes, radio and checkbuttons, lists...) directly from an database table. You select the database and the table, choose which fields you want to have in the form and which type they should be.. and click "generate"! 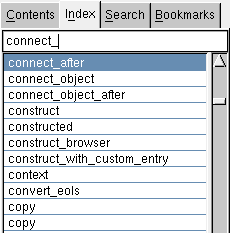 Template for forms using PHPLib-Templates included, own code templates can easily be created. 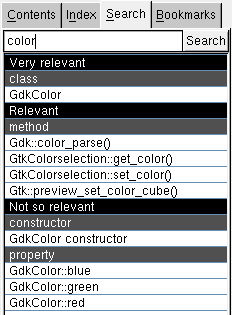 One thing missing in the GTK is a MessageBox function. 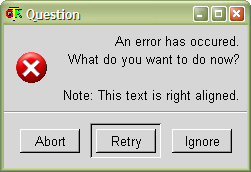 I've written such a one which is nearly full-compatible with the VC++ MessageBox function. You can use the pre-defined buttons or define your own ones. The icons are Windows-XP style. 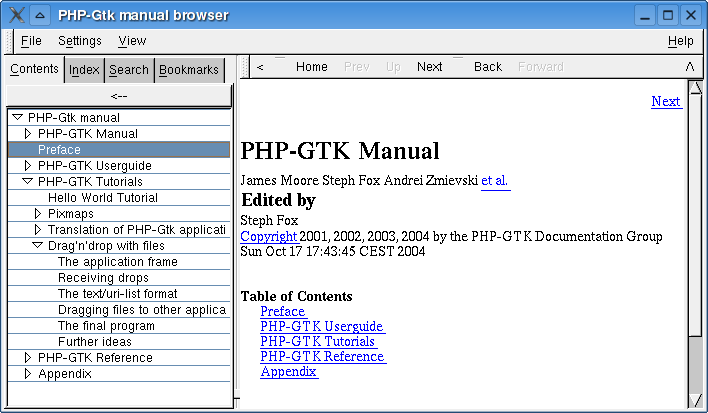 The manual browser provides a TOC, index, search and bookmark functionality for the PHP-Gtk manual. You can navigate rapidly throught the docs, viewing the pages in the internal (with scalable fonts) or in your favorite browser (like Opera or Firefox). It has an in-built update functionality which can update parts of itself (when the manual has changed) over the internet as well as it can tell you when a new version of the browser is out. The Ximian icons are the "official" styled icons for gtk applications. Here they are as .xpm files and php-arrays. Included are: 61 24x24 and 16x16 toolbar-icons (copy, paste, zoom and so) and 122 48x52 MIME icons. I used ImageMagick for conversion. This small script converts your *.xpm files to php-arrays, which you can use in your php-gtk scripts without the need of having external .xpm files.